FLORIDA Embroidered Patch & Emblem, Inc.
10 day delivery time or less on our Embroidered Patches. Completely Woman Owned - Main-Office in Florida U.S.A.
Florida Embroidered Patches Is Known As One Of The Leading Embroidered Patch and Emblems Companies In The World. We Have Been In Business Over 45 Years and We Are Second To None. We Specialize in Embroidered Patches, Custom Uniforms Patches & Emblems, Sheriff, Police, Military, Fire, Law Enforcement, Army, Navy, Highway Patrol, Boy Scouts, Girl Scouts, and Many, Many More as well as Badges Of All Kinds. We Can Even Make Your Blackinton® Badges Into a Very Detailed Embroidered Badge. We Also Have a Large Stock Selection on Flags, EMT's, Paramedic, Police, Security and Other Stock Patches and Badges. We Have All of the State of Florida Items You Need for Your Agency. Let Us Match Your Chevrons, Hash Marks and Service Bars to Your Shoulder Patches. Let Us Take Your Embroidered Patch and Place it On A Hat, Much Better Detailed and Less Expensive Then Embroidery. 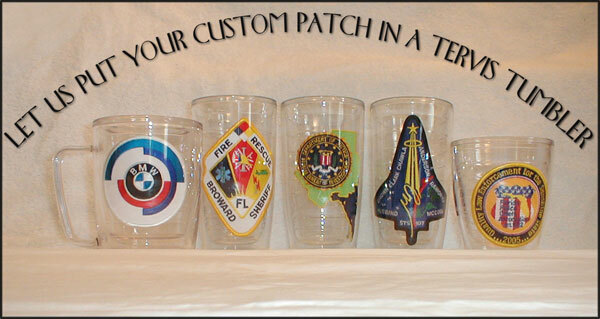 Let Us Put Your Embroidered Patches Into Tervis® Tumblers. Lifetime Guarantee. Call Melissa at Florida Embroidered Patch, Inc. and You Will Experience Why We Say “We Will Bring You The World As Long As Its On A Patch” and “We Are Second To None”. To see some of our FINE work just click on "Embroidered Patches". THESE CUSTOM EMBROIDERED PATCH DESIGNS ARE CREATED AND PRODUCED EXCLUSIVELY FOR THE AGENCY OR AGENCIES WHOSE LOGO, NAME OR IMAGE IS INCORPORATED INTO THE DESIGN. ADVANCE REGISTRATION HAS BEEN MADE ON BEHALF OF THE AGENCY OR AGENCIES. THEREFORE THIS EMBROIDERED PATCH CUSTOM DESIGN IS HEREBY PROTECTED UNDER ALL APPLICABLE U.S. AND INTERNATIONAL COPYRIGHT AND TRADEMARK LAWS. RESALE OR REPRODUCTION WITHOUT EXPRESS WRITTEN CONSENT IS STRICTLY PROHIBITED. RESALE AND/OR REPRODUCTION VIOLATIONS WILL BE AGGRESSIVELY INVESTIGATED AND VIGOROUSLY PROSECUTED. © Florida Embroidered Patch and Emblem, Inc. All the rights to the original artworks and text belong to FLPATCH.COM. Please note that all graphics and work pieces in this site are not to be distribute without prior permission. All rights to the patches belong to FL. Embroidered Patch & Emblem Inc. and their rightful owner.